My suspicions of Katie having Alcohol Related Neurodevelopmental Disorder, a branch of Foetal Alcohol Spectrum Disorder were confirmed along with a diagnosis of ADHD. I'd really hoped to be wrong with my fears and it was a time I would have been happy to be proven wrong because the fear for her future outcomes is at the forefront of my mind. Once the dust of the house build and move has settled I think we might look at more testing to understand the impact and long term implications of Katie's learning and what support she will need. There's a part of me that wants to read more and understand as much as I can and then throw away the books and not feel held back by fears. For the time being we've decided not to tell Katie about the diagnosis other than to say the doctor is helping us understand why she can't sleep. We've talked about the wiring in her brain not producing the right hormone to help her sleep and she is delighted that the tablets help her sleep and make her feel normal potentially opening up the door to future sleep overs at Brownie camp and with friends (if my anxieties ever quieten down). We've decided against medication for the ADHD for the time being. Katie is coping well at school and is well supported in the classroom. Her restlessness and hyperactivity are noticed but she is making good progress and the school manage her well. My main worry is for friendships as she grows older and whether a gap of immaturity will become a hindrance. Having solid friendships is such an important base for future outcomes. Having friends who are caring and will take care of Katie and not lead her astray. Katie has a high level of non-compliance at home, will this seep into school life and beyond bringing problems for her? How can we help her? 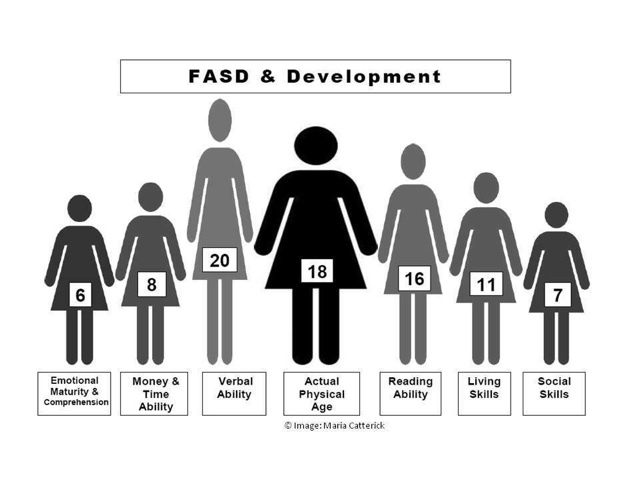 Reading about FASD online provides good information but I need to hear more from young people with FASD to hear about their lives as young adults and the challenges they face and the successes they have. Do they live independently with success? Do they have positive friendships? Does their emotional vulnerability and naivity cause problems with friendships and being taken advantage of? Are they more likely to have difficulties where poor decision making gets them into trouble with the law? I have so many questions. I think a step forward will be to understand Katie's cognitive processing and IQ more fully to try and understand her unique strengths and challenges and try and understand where on the spectrum she sits and how we can help her develop her strengths and find coping mechanisms for the challenges she experiences. The stress of the house is over-riding my emotions on Katie's diagnosis somewhat currently. I feel I need some emotional space to reflect and maybe even have a really good cry. I know I feel angry that someone else's choices have impacted so heavily on Katie and will do so for the rest of her life. I've got to find somewhere to try to understand and unpack my feelings. I'm concerned about what that life will look like for Katie and for our family. She is very challenging at the present time and we need more training in how to parent her well to try and lessen the stress on our family life. Life is full of arguments and door slamming and swearing and oppositional bevahiour. It's unpleasant and reminds me of the family I grew up in. I escaped that life and most of my family as a result and I'm terrified of my home life continuing to be a war ground and how much that might escalate as Katie grows older and bigger. I want to be a good parent, not the overwhelmed shouty mummy I become after a day of endless oppositional behaviour. I need to find the love more but it's so hard currently. I'm reading Bryan Post and trying to understand how to step back and see the fear behind the behaviour and not just react to the behaviour. I'm not even sure how that works with someone whose brain reacts differently to scenarios. Is it just a fear response? Is it the wiring in the brain? Hopefully with extra support from Post Adoption and some time to settle back Into the nurturing environment of our soon to be lovely home we can find our feet again and create the life we all need. I hope we can fulfil that dream, I really do. If you've been effected by FASD and ARND and can share your experiences with me and answer some of my questions I'd love to hear them.